When the NCAA pulled its licensing from college sports video games it became not just a possibility, but a probability, that conferences and individual schools would follow. Yesterday the conferences began to make known they would no longer license themselves out for video games. Now schools are starting to follow. The first of what is sure to become many to make a public statement that they will no longer authorize inclusion in video games is the University of Washington. The topic was broached in a chat with athletic director Scott Woodward. 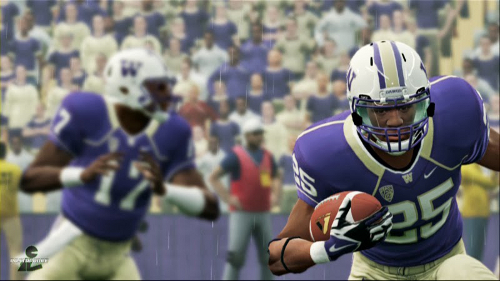 Q: It sounds like the Pac-12 will not license its trademarks with EA Sports. Will UW? A: We do not plan to. Licensing is done from the main campus, but we will advise them not to. Ironically late last year the Huskies presented captains with their own personalized NCAA Football covers. A number of schools have likely already reached this decision or are leaning that way but have not commented publicly. With the cover provided by the NCAA and conferences being lost – remember ongoing lawsuits name the NCAA, CLC, and EA as defendants and do not single out schools – individual institutions become far more at risk of becoming the target of litigation in the future. The surprise here is that the college football series from EA Sports may be cancelled before even a determination is made in the likeness lawsuit which has led to all the defections. [Update] Existing contracts may keep the SEC and schools like Washington from leaving immediately according to Kotaku.